2017-18 SEASON: Played in 62 games (12 starts) during his rookie campaign with Orlando, averaging 3.7 ppg. and 2.2 rpg. in 16.5 minpg.…As a starter, averaged 6.1 ppg., 2.7 rpg. and 1.3 apg. in 26.9 minpg…Scored in double figures three times, including a career-high 12 points on Dec. 23 @ Washington and Jan. 6 vs. Cleveland…Pulled down a career-high seven rebounds on Feb. 14 vs. Charlotte and Apr. 4 vs. Dallas…Recorded at least one steal 26 times and two-or-more steals six times, including a career-high three steals on Mar. 14 vs. Milwaukee...Made his NBA debut on Oct. 21 @ Cleveland, tallying one point and two rebounds in five minutes…Recorded his first NBA point on a free throw with 2:08 left in the fourth quarter…Made his first NBA start on Dec. 13 vs. L.A. Clippers, tallying six points, three rebounds and two assists in 33 minutes…Missed two games (Mar. 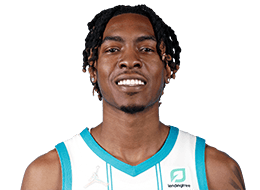 28-30) due to an illness…DNP-CD six times and on the Inactive List 12 times…Also played in nine games with Lakeland of the NBA G League, averaging 15.2 ppg., 8.6 rpg., 1.8 apg. and 1.22 stlpg. in 35.0 minpg. CAREER TRANSACTIONS: Selected by Orlando in the second round (33rd overall) of the 2017 NBA Draft…Played with Lakeland of the NBA G League (2017-18). Played in 132 career games (124 starts) during four seasons at Kansas State University, averaging 9.5 ppg., 4.7 rpg. and 2.8 apg. in 28.2 minpg…The first player in school history to record at least 1,000 points, 500 rebounds, 300 assists and 100 steals during his career…His 124 starts are a school record and finished career third all-time in minutes played (3,728), fourth in assists (366) and fifth in steals (121)…One of only six Kansas State players during the Big 12 era to earn All-Big 12 First, Second or Third Team honors twice during his career, being named All-Big 12 Third Team as a junior (2015-16) and a senior (2016-17)…As a senior (2016-17), played and started in all 35 games, averaging 13.0 ppg., 6.3 rpg., 3.5 apg. and 1.00 stlpg. in 31.4 minpg., while shooting .481 (151-314) from the floor and .376 (32-85) from three-point range…Led the team in scoring and rebounding and was named to the All-Big 12 Third Team by the league’s coaches…Joined Mitch Richmond (1987-88) as the only Wildcats to record at least 400 points, 200 rebounds and 100 assists in a season…During his junior campaign (2015-16), played and started all 33 games, averaging 11.9 ppg., 4.5 rpg., 3.7 apg. and 1.33 stlpg. in 32.4 minpg….Named to the All-Big 12 Third Team and to the Big 12 All-Defensive Team by the league’s coaches, after leading the team in assists and minutes played, while ranking second in scoring and steals…Was the only player to start all 33 games for the Wildcats…As a sophomore (2014-15), appeared in 31 games (24 starts), averaging 5.8 ppg., 3.5 rpg. and 2.0 apg. in 25.2 minpg….During his freshman season (2013-14), played in 33 outings (32 starts), averaging 6.7 ppg., 4.2 rpg. and 1.8 apg. in 23.6 minpg. Full name is Wesley Deshawn Iwundu…Parents are Larry and Marilyn Williams…Has two older siblings, Chris and Kim…Earned his bachelor’s degree in family studies and human services in May 2017…Named to the Big 12 Commissioner’s Honor Roll three times, including a 4.0 GPA during the spring of 2017, and was named to the Academic All-Big 12 First Team as a senior (2016-17)…You can follow him on Twitter: @_Iwundu25.